There are sooooo many reasons for taking essential oils internally (though not just any brand is safe... read more about quality here.) There are so many different miracles that these oils can do for a variety of physical challenges to bring restoration and wellness to all the systems of our body. There are many targeted, long-term wellness protocols that involve taking some very powerful oils like Longevity, Frankincense, Sacred Frankincense, DiGize, GLF, or Ledum. Then there are other temporary protocols that may involve taking oils for wellness-boosting, like Thieves, Thyme, and Oregano in the cold weather months. Whatever your needs, you’ve heard it before: “There’s an oil for that!” And if that oily solution involves getting more than a couple drops inside of your system, here’s how to do it. For this method, I only recommend making 1-2 capsules at a time. That’s because making capsules with olive oil sometimes means a bit of leakage after a while, so I don’t recommend taking a bunch of them to work in a ziploc bag. Your purse and laptop will smell quite pungent. To make a bunch ahead of time, here’s my trick. Note that the melted coconut oil is in a stainless steel bowl. You’ll need glass or stainless, not plastic, so it can be heated, and because oils and plastic don’t mix! 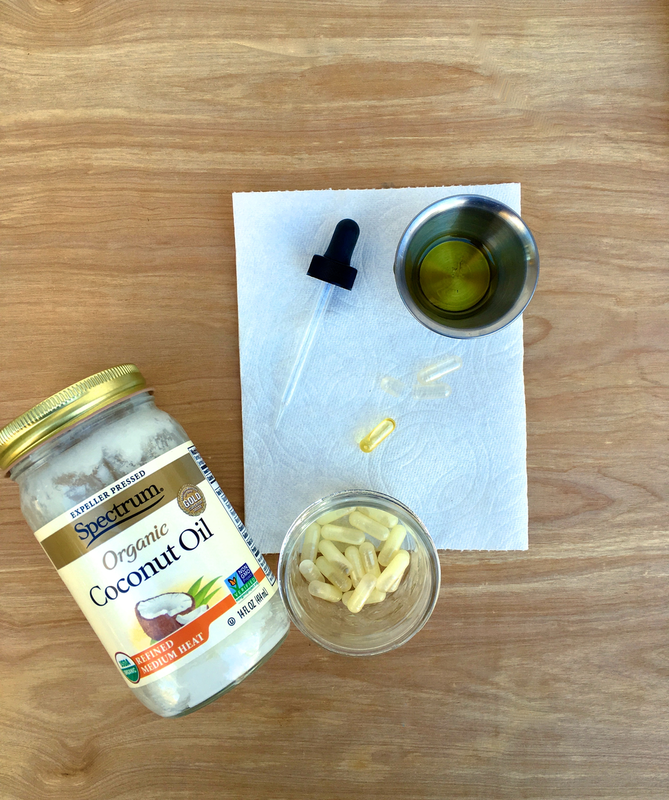 Here’s the trick: By using COCONUT oil, melted first, then storing the capsules in the fridge so they solidify, your DIY pills won’t leak! Warm 1 tsp of coconut oil (not in microwave!) in a tiny bowl by setting it in a bowl of hot water. Whatever your targeted “drops per capsule” are, multiply that number by 8 and add those essential oil drops to the coconut oil. Shake to mix, and store in fridge. Fill capsules about 3/4 full. You can buy these at the health food store, but you’re probably going to pay about $12 for 100. I ONLY get mine at Abundant Health’s site, about $4 for 125. While I’m there, I add on a few packs of roller bottles and nasal spray bottles too. (This is also the publisher of the trusty oils reference guide book & app!) See below for links to various capsule types. I only like to use size “0” capsules, because they’re easier to swallow, and I rarely ever need capsules that will hold over 15 drops of essential oil! I get these size “0” capsules here. But if you do want larger capsules for that volume of drops, size “00” is what you need. When I need something instantly, I will use an Immediate-Release (or “regular vegetarian”) capsule. Moisture dissolves them and releases the oils quickly after swallowing. I get mine here. Hope this is helpful! While we should never underestimate the power of diffusing and applying topically, in those special situations where ingesting is preferred, these guidelines will help!